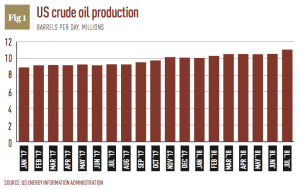 This July, the US crude oil industry celebrated a groundbreaking moment when its output averaged an estimated 11 million barrels per day (BPD) for the first time ever (see Fig 1). This makes the US the world’s second-largest producer, behind only Russia. The surge is largely down to the boom in shale oil and gas production in the Permian Basin across the west of Texas and south-east New Mexico. Drilling in the region began to ramp up a decade ago, and it is only projected to continue growing. But there is one hurdle standing in the way: a lack of critical infrastructure. In recent months, producers have experienced pipeline bottlenecks due to the vast amounts of oil and gas being pumped out of the Permian Basin, where output has reached around 3.4 million BPD. With the current pipeline capacity sitting at approximately 3.56 million BPD, analysts expect the constraints to begin limiting growth in the region next year. Before the rapid development of America’s shale industry caused a new surge in crude output, US oil production peaked at about 9.6 million BPD in 1970. After that, it decreased steadily, falling as low as five million BPD in 2008. Around this time, however, producers revolutionised the industry by using hydraulic fracturing, or fracking, and horizontal drilling to extract oil and gas trapped in reservoir rocks. Production soared at the fastest pace in the country’s history, upending the global oil and gas industry. The Permian Basin is at the centre of the US shale boom. It is one of the world’s thickest deposits of rocks from the Permian geologic period, and along with the legendary Ghawar Field in Saudi Arabia, the Permian is one of the world’s most prolific. Since 2012, production there has grown by about two million BPD, which is more than any other field. It is estimated that another 75 billion barrels of recoverable oil lie within the Permian. Brian Collins, a senior researcher at S&P Global Market Intelligence, told World Finance that this basin will be the “mainstay for US production for the foreseeable future”. Its success, however, is beginning to highlight cracks in the area’s infrastructure. By the end of 2018, BP Capital Fund Advisors expects production to exceed available pipeline space by 300,000 to 400,000 BPD. By 2019, that gap will rise to 750,000 BPD, causing a “significant” amount of oil to be stranded in the basin. And it is not just oil pipelines that are unable to keep up with demand – the associated natural gas production has also overwhelmed the system, and the accompanying water that is produced is becoming a problem too. For every barrel of oil produced, between three and five barrels of contaminated water must also be piped away. Additionally, more pipelines will soon be needed to handle natural gas liquids, which are components of natural gas. “So we’ve got basically four different infrastructure systems that are extremely challenged right now. This basin is not going to stop growing, either. It’s going to keep growing as these companies expand across it,” Collins said. As news came to light in May that pipeline bottlenecks were constraining crude shipments, the share prices of companies based in the region started to slide. At the beginning of June, Bloomberg reported that eight of the basin’s pure-play drillers had lost $15.6bn in combined market value in just two weeks – or around $1bn a day. What’s more, oil behemoth BP recently revealed its oil trading unit had swung to a quarterly loss due to the Permian bottlenecks, which have led producers in the region to sell their crude at a hefty discount relative to benchmark West Texas Intermediate prices. While the spread was as little as 40 cents at the beginning of the year, it reached between $15 and $20 a barrel in August. This discount is expected to persist for at least another year. Not only are producers grappling with discounts on their oil, but in response to the squeeze companies have also been forced to go down the expensive route of storing their crude or driving it hundreds of miles on trucks to pipelines in other parts of the state. Because of this, ConocoPhillips – one of the top oil producers in the US – revealed in June that it would temporarily redeploy resources out of the Permian Basin. “We have other opportunities to go spend our capital,” CEO Ryan Lance told the Financial Times. “And I am not sure it makes sense to drill into that headwind.” A number of other companies both big and small are beginning to “shift their emphasis to other basins”, Collins said. But while oil and gas firms with deep pockets can wait around for returns on their investments, the midstream companies that build the desperately needed infrastructure cannot make investments into pipelines without knowing if they will receive a steady volume of oil or gas. “An issue right now is a lot of the natural gas pipelines that are needed are having a hard time getting off the ground because producers are not necessarily used to having to pay somebody to build them a pipeline to get rid of their gas,” Collins said. Even one of the largest pipeline builders in the US, Kinder Morgan, is conservative about the prospect of building new pipelines. According to BP Capital, “meaningful relief” is set to come to the Permian in the second half of 2019 with the set-up of key long-haul pipelines, such as EPIC, Gray Oak and Cactus II. The International Energy Agency (IEA) said TexStar Midstream Logistics’ EPIC pipeline – one of the biggest and most advanced projects in development – “holds the key to solving pipeline bottlenecks in 2019”. The pipeline was originally set to carry 440,000 BPD, but it could be upgraded to transport 675,000 BPD due to high demand. Once these pipelines are in place, crude oil produced in the region is expected to stop selling at a discount compared with benchmark prices. In BP Capital’s view, the sell-off in the region’s exploration and production firms was “overly severe and particularly short sighted”. 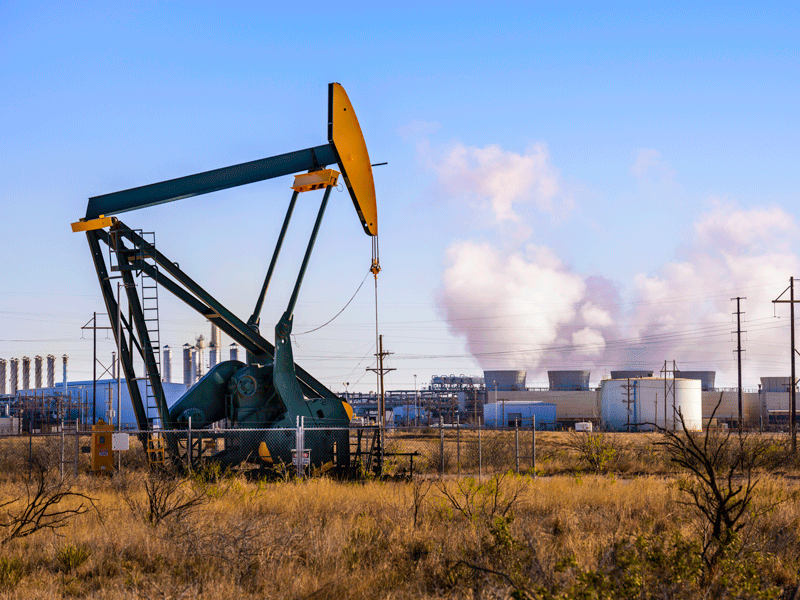 The firm stressed in an online article that the bottlenecks are a “relatively short-term issue that does not diminish the long-term attractiveness and potential of the Permian Basin”. There are additional concerns that the pipeline projects could face delays. Analysts at Morgan Stanley expect slowdowns of three to six months for some projects due to the complexity of the proposed lines. This could lead to the production of just 360,000 BPD in the Permian Basin in 2019, Morgan Stanley said. Some midstream companies also face higher-than-expected material costs because of President Donald Trump’s 25 percent tariff on steel imports. For Plains All American Pipeline, which is building the 585,000-BPD Cactus II pipeline, the tariff has increased the cost of its $1.1bn pipeline by about $40m. However, it is unlikely the basin’s problems will end in 2019. Production is expected to continue ramping up in the region in the decades to come, and the planning process for building pipelines appears to be flawed. Collins said a new type of financing would be needed to allow producers to better cooperate with midstream players: “If oil and gas companies actually formally commit and sign on to be a shipper on a pipeline, that’s how these pipelines will get built.” Yet, Collins admitted, most producers are reluctant to own their own pipeline. Although the new pipeline projects face some potential hiccups, the current bottlenecks in the Permian Basin are indeed a short-term problem. But the industry should take it as a warning that until a more cooperative process is formed between producers and pipeline builders, this could be the first glimpse of an issue that could plague the future of one of the world’s top shale basins.